Looking for your first freeskate that takes you everywhere, but not into spending a fortune? 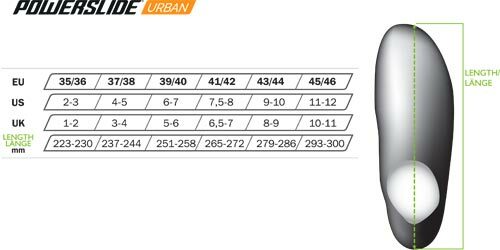 Powerslide Imperial Basic urban inline skates are the right choice! It scores high with a comfortable liner, a supportive hard shell & an easy to use 45° velcro strap. Lightweight frames, 80mm wheels & Wicked bearings guarantee a good start. The Imperial Basic is an all-round skate made for cruising, freeriding & your first steps in slalom skating. The shell of the Imperial skate is made of composite material, which is reinforced with 15% fiberglass to make the shell strong and stiff. The base of the mounting blocks is big and wide which provides a large contact area between the frame and boot. The cuff was designed with support in mind. It is made out of a special composite compound that is super stiff thanks to the 15% fiberglass, which was mixed into the material. This skate is equipped with the “Fat Boy” Dual Size liner. As the name says it all this new liner covers two sizes. Thanks to the stretchy material the toe part will expand by one size without putting pressure on your toes. This new liner is as comfortable as the previous one , but comes with a stretch toe cap, which covers two sizes – like the shell also does. This liner is a real masterpiece. The last was created by Sergio Mc Cargo, the No.1 shoemaker in the inline skating world. The liner is fully lasted. It has a perfect shape and fit, it wraps around your foot like a sock. The liner is light and also features a dual density innersole and a carrying strap. The Powerslide Gamma frame is made of 6063 aircraft aluminium and is based on a double voided construction. The extra ribs between the wheels increase the stiffness and help to lower the weight. The frame is basically a simplified Alpha frame. The frame therefore is also very stiff and very well balanced. The frame comes with hollow single axles made of steel. The combination of the across slot in the frame and the along slot in our boots is called the X-Slot Mounting. 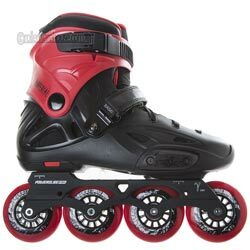 This system enables you to adjust the boot-frame setup without any dead spots according to your skating style and preferences. Powerslide Hurricane wheels come in 80mm / 85A hardness. WICKED (WCD) is a new high end bearing brand specializing in all kinds of rollsport. WCD is made of the best available raw materials and crafted with high quality to guarantee a fast and smooth ride but also a long lifetime. WCD ABEC 7 Freespin bearings have a very good and smooth spin. The bearing contains 7 chrome steel balls and a light weight but resistant nylon cage. One side is covered by a non contact rubber coated RZ shield. A synthetic oil from Japan is used for this high end bearing. The Imperial skate features flat laces which tighten well. A velcro power strap is placed at 45° to keep the heel in place and a standard buckle on top of the cuff provides a secure wrap.